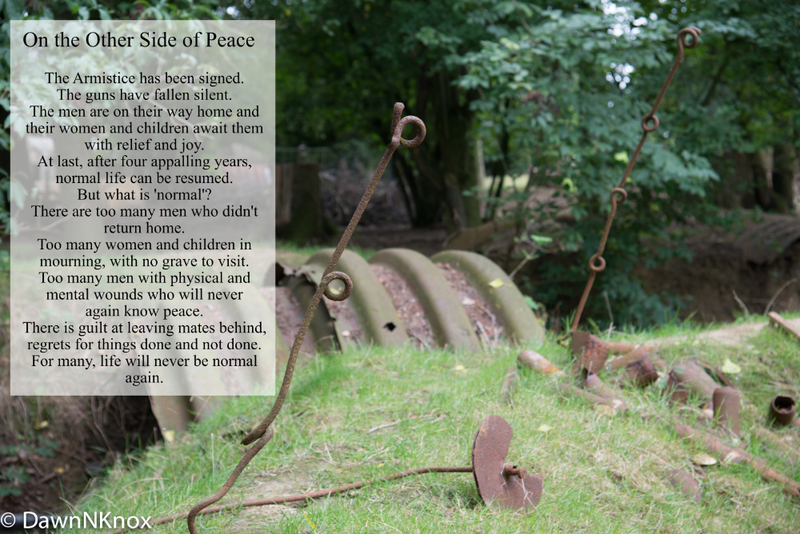 One hundred years ago today, the guns in many parts of the world fell silent. Some time later, men of all nationalities began to return to their homeland, perhaps with hopes and dreams of resuming their pre-war lives. With the benefit of hindsight, we know that life was going to prove to be a challenge for those who came home and for those who waited for them. Many, as we know, were wounded physically and mentally and had to live with their visible and invisible scars. Not only that, but their families had to cope too. Here, in exactly one hundred words I have tried to encapsulate a brief window in time in 1918. The Armistice has been signed. The guns have fallen silent. The men are on their way home and their women and children await them with relief and joy. At last, after four appalling years, normal life can be resumed. There are too many men who didn’t return home. Too many women and children in mourning, with no grave to visit. Too many men with physical and mental wounds who will never again know peace. There is guilt at leaving mates behind, regrets for things done and not done. For many, life will never be normal again.